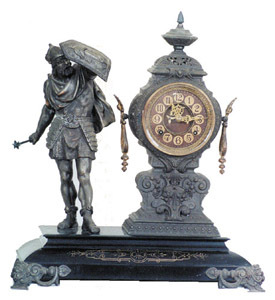 Ansonia Clock Co. figure clock, "Attila", ca 1894, one of the hard to find pair called the "Combatants". The other figure is called "Mars". The metal case is 21 I/2 inches high and 19 I/2 inches wide. Originally finished in Japanese Bronze. The finish is now very dark, has never been cleaned or refinished. All the parts are intact, the mace, the shield, urn, and side pieces. Dark brown dial, recessed numerals, open escapement, nice hands. Good, heavy beveled glass. The movement is 8 day, striking half hours on a cathedral gong, and running. Correct pendulum. Good original standing statue of a hard to find figure. Did you see the enemies head hanging on his belt? Ly-Ansonia No.476.